Sydney Direct Fresh Produce goes the extra mile to deliver only the best to its chef clients. When a box of fresh white asparagus lands in front of Sydney provedore Luke Kohler direct from one of his key growers, he immediately snaps a photo of the earthy delicacy and uploads it to social media to whet the appetite of the state’s top chefs. Luke knows his clients, primarily chefs, will be busting for a tray of the boutique vegetable to serve up to their valued diners. While SDFP’s mission is to supply NSW restaurants, hotels, clubs, pubs and cafes with the freshest and finest produce available, it’s also about educating chefs. It’s why SDFP has branched out and started tours to take chefs away from the kitchen to the source of the produce. Social media didn’t exist when Luke started working 18 years ago at the heart and soul of the state’s fresh produce centre, Sydney Markets. As a 16-year-old, Luke had a dream of becoming a top provedore – and he’s been happy to get his hands dirty along the way. He clearly remembers his first client – a kebab shop in Penrith – for which he would hand-pick and deliver the best tomatoes, onions and salad. Word quickly spread in the area about this young bloke’s passion, handson approach and dedication in delivering the freshest quality of produce. Even now as SDFP managing director, Luke and his team still treat every new customer with the same amount of respect as he did on that first delivery. SDFP has moved into an impressive $6 million state-of-the-art facility in Huntingwood, which houses high-tech, temperature-controlled coolrooms, while still maintaining a warehouse and cold storage facility within Flemington’s Sydney Markets. 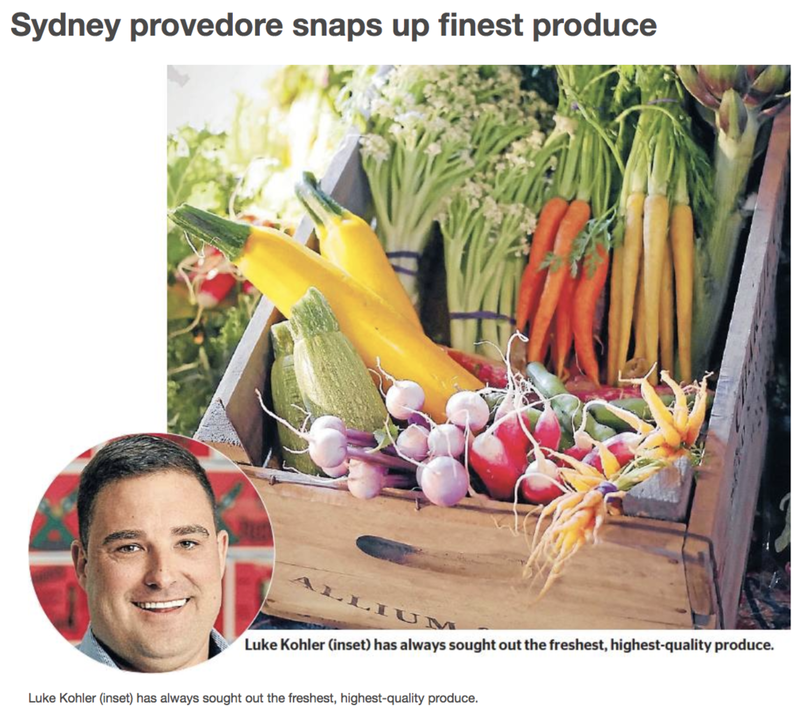 When it comes to Luke’s nightlife, you’ll find him at Flemington Market around 1am, when he and his buyers have a three to fourhour window to hand-pick the best in-season produce as it’s delivered directly from growers to the markets. In that time, the SDFP team picks, packs and delivers the produce around Sydney and anywhere else in NSW in its 20-strong fleet of refrigerated trucks. It’s a slick operation but there are plenty of A-list clients relying on SDFP – including Bondi’s Icebergs group and Matt Moran’s Solotel group, which includes the likes of Chiswick, Barangaroo House and the Opera Bar. The supply map goes Australia-wide, from Queensland’s tropics for produce such as mangoes, tomatillos and chillies to the Apple Isle for staples including potatoes and strawberries – with SDFP going the extra mile to educate its clients on the source of the produce. ‘‘We took 12 key chef clients to Tassie to dive for scallops, drink chardonnay and get educated on wild mushrooms and to simply relax,’’ says Luke.